Say goodbye to shaving, tweezing and waxing. Rejuvena Cosmetic Medical Center proudly offers the safest and most effective method of permanent hair removal available today. Using state-of-the-art, long-pulse laser technology, our laser hair removal is ideal for all skin types, on every part of the face and body. If you are looking for an effective, long-term solution to unwanted hair, please call 405-842-1100 today to schedule a free consultation. We welcome patients from Oklahoma City, Norman, Edmond and every community throughout Oklahoma and beyond. 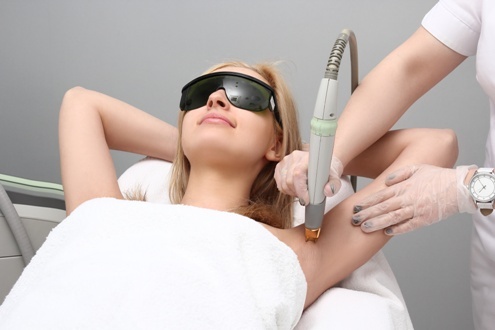 Laser hair removal is one of the most popular and common cosmetic treatments in the country. It eliminates the mess, discomfort and inconvenience of shaving, waxing, tweezing or using harsh chemical depilatories to remove unwanted hair. Treatment is suitable for every skin color and complexion. Treatment is highly precise; there is no damage to surrounding areas. Skin is smooth and silky after treatment. Treatment gives most patients permanent hair loss after repeated sessions. As we age, our hair becomes coarser, darker and more visible. When you choose laser hair treatment at Rejuvena Cosmetic Medical Center, you can put an end to the embarrassment of dark, thick, unwelcome hair and the discomfort of and unsightly ingrown hairs. Call us today to schedule a free initial consultation. Your hair follicles aren’t all active at the same time. Laser hair removal only works on actively growing follicles, so multiple procedures are necessary to treat all of the targeted area effectively. No anesthesia is needed for treatment and most patients describe the procedure as feeling like a rubber band is being lightly snapped against the skin. Joan Hardt, M.D.is committed to remaining at the forefront of today’s most advanced techniques and technologies. She demands nothing less than the very best for her patients, and only uses methods that are proven safe and highly effective. While other clinics advertise laser hair removal, it’s important to realize that not all lasers are state-of-the-art or ideal for long-term results. Dr. Hardt is an expert in laser technology and their diverse uses, and only brings the best to Rejuvena Cosmetic Medical Center to provide you with optimal results. If you’re ready to boost your confidence and save time during your daily routine by permanently removing unwanted hair, please call Rejuvena Cosmetic Medical Center today at 405-842-1100 to schedule your free initial consultation. We serve patients from every corner of Oklahoma and across the country, including Oklahoma City, Norman and Edmond.